Do these cheap wired noise cancelling earbuds live up to expectations? TaoTronics noise cancelling earbuds (model TT-EP002) have basic functionality, decent active noise cancellation, and a fantastic (cheap) price. Offering the best price/performance in its range. Let us dive into the details. TaoTronics TT-EP002 Active Noise Cancelling Earbuds unboxed. 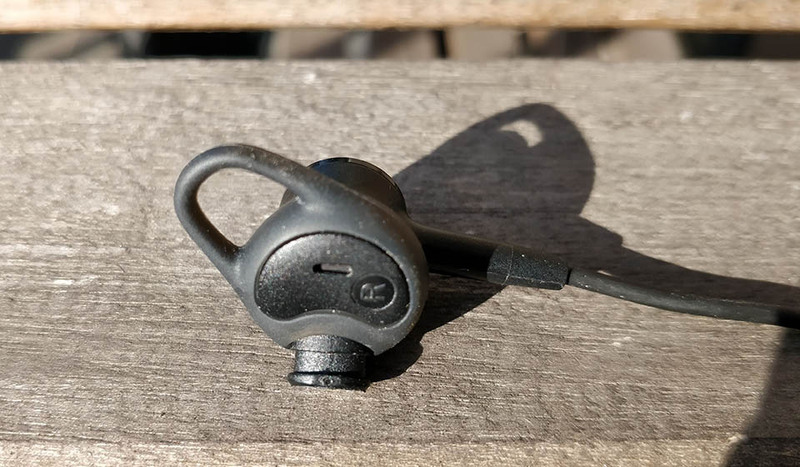 The TaoTronics ANC buds TT-EP002 are pleasant to wear. The buds themselves are of average size and sit nicely in your ear. You can combine different eartips and ear hooks to find the fit for your ear shape. Overall, they stick in your ears nicely, and you can wear them for hours without discomfort. The only thing that’s a bit cumbersome is the packet where the active noise-cancelling circuitry is working its magic. It’s slightly pulling down which might be annoying if you’re moving. Since you’ll probably use them while commuting—meaning sitting down—this isn’t such a huge issue. They are light even though you are wearing a battery on the cable. Their weight is 0.88 Oz (25g). So, comfort and fit are a non-issue, and you’ll soon forget you’re wearing them. You can put the buds in a soft pouch for easier transportation. TaoTronics headphones have decent noise isolation by themselves since they’re in-ear monitors. The design “forces” you to put the silicone ear-tips deep in your ear canal. It’s still comfy though. The bad thing is, some of the cable noise is present. They have a low microphonics effect. Though nothing to worry about since you won’t be using these for activity. Now, as for the noise cancellation, it’s noticeable and works immediately after you press the ANC button. But, it’s less effective compared to more expensive noise cancelling buds. The price does matter here, and these are so cheap they probably didn’t put in the best technology. Nonetheless, it works well enough for the price and noticeably lowers the unwanted background noise. On one charge you’ll get 15 hours of power and charge to full capacity in about 1h. Supposedly, it reduces ambient noise up to 25dB (which doesn’t tell the whole story). Related: Check the top noise cancelling headphones. The housing is plastic and metal. The ear hooks and ear tips are made of soft silicone. And, the wires are tangle-free and rubber protected. Overall, they are well-built buds. The 2 buttons control ANC. Button A turns cancellation on/off and the button M controls monitor mode. Also, the in-line microphone is located on the right side together with the remote control. You get 3 buttons to control: play/pause, pick up/decline phone calls, volume +/-, and next/previous for songs. There’s also the switch for noise cancelling (marked with A) and “monitor mode” button (labeled with M) for when you want to hear your surroundings. On module, there is also a light that glows green when Active Noise Control is active. The light switches to red when the battery is low. Moreover, when you press the M button, it pauses the noise canceling and lowers the volume, but only works in Noise Control mode. You charge them with a micro-USB cable. The battery case is metal 2.16 inches (5.5cm) long and 0.71 inches (1.8cm) wide. On end, you can find a straight 3.5mm plug protected by a metal layer. The in-line remote (and mic) comes with 3 buttons. You get a few extra things. Like the usual, you get 3 pairs of silicone ear tips (small, medium, large) and 2 pairs of silicone ear hooks (big and small). 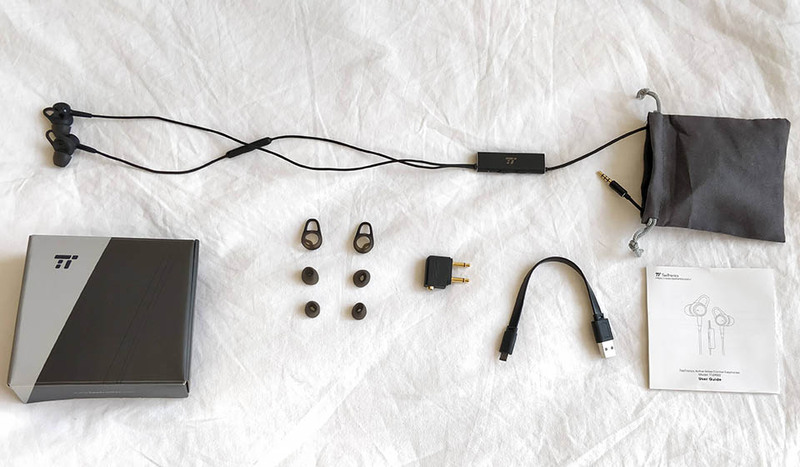 Since these are noise cancelling earphones you also get an airline adapter and a travel pouch in case you take them on your trips. It’s a welcome accessory that will be useful if you fly a lot. 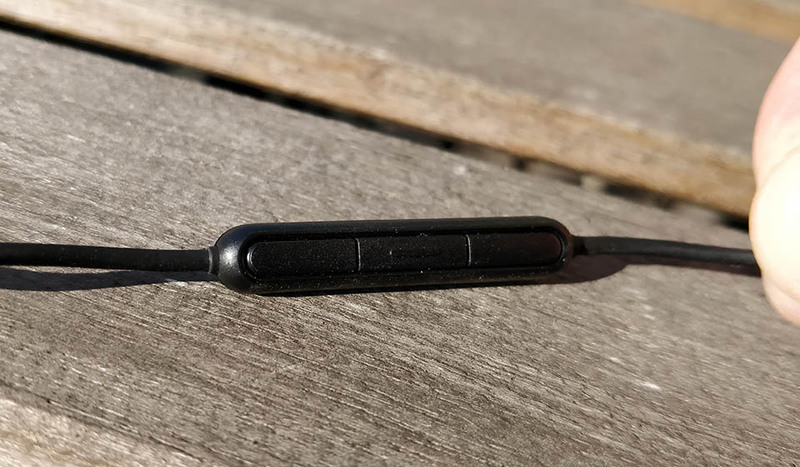 The left and right earbud marks are well visible. 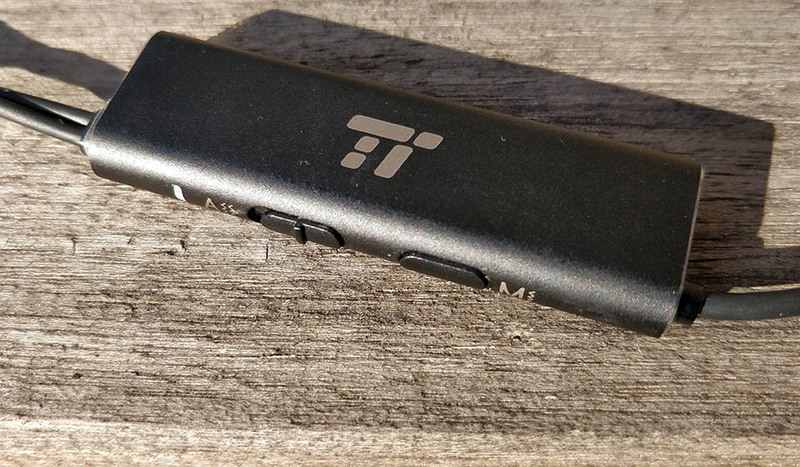 First, you need to know that the sound of these TaoTronics noise-canceling earbuds isn’t expected to be high-end, because it’s not. These are budget earbuds after all. Nonetheless, they sound well enough to enjoy music and movies without major earache. Plus, they get very loud–you can make yourself deaf without a problem. There is a noticeable difference in sound quality when you turn on the noise-cancelling. It becomes louder and also a bit muffled. Lows are there but don’t get too strong. Bass isn’t their strong suit. An audiophile will hear a slight lack in details and some distortion, but for what they are, they sound decent. In conclusion, the budget TaoTronics TT-EP002 earphones have a nice sound with a balanced sound signature that’s suited for all genres. 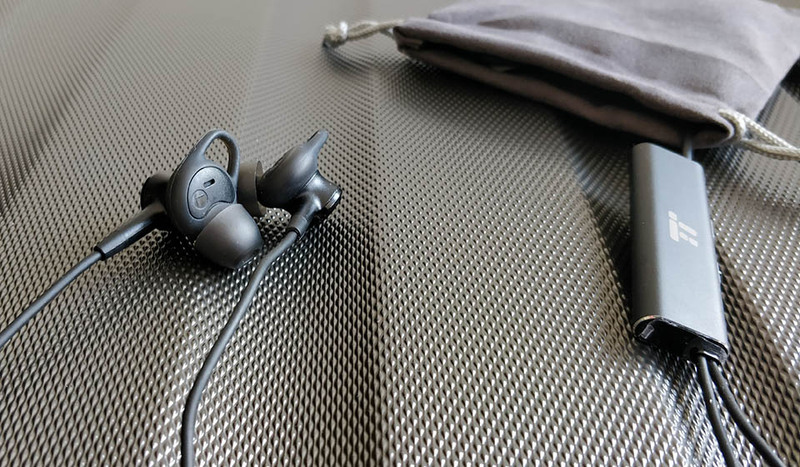 And, considering the price, comfort, build quality and the fact they are active noise cancelling, they are the best choice for a price-conscious buyer right now.